Is China helping Trump, or is Trump helping China? When Chinese president Xi Jinping met US president Donald Trump in Florida on 6–7 April, Xi convinced his host that it is not easy to exert influence on North Korea, but apparently promised to help the United States to the best of his ability. In practice, it may be Trump who helps China. 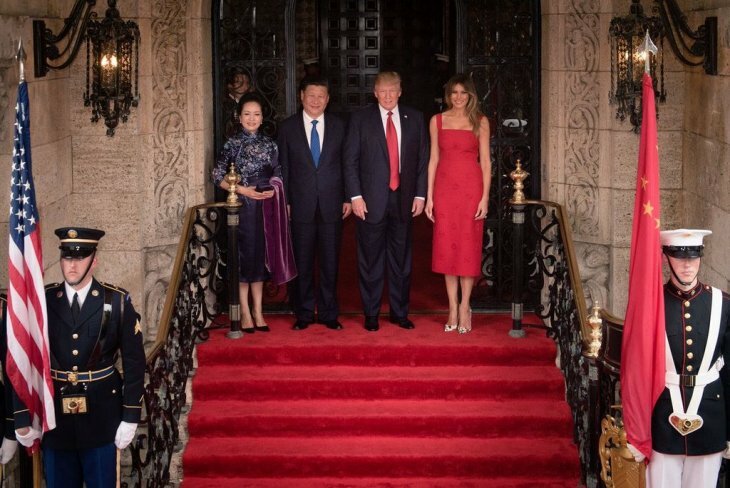 Following the summit at his holiday paradise of Mar-a-Lago, Trump has said that he promised Xi favourable trading terms with the United States on the condition that Xi helps the United States against North Korea. China could invade North Korea and take control of its nuclear facilities, but that could provoke North Korea to launch a nuclear attack on China. China could stop supplying North Korea with oil or cut off food supplies, but that would affect ordinary North Koreans, cause famine and result in many people fleeing to China. China could stop money flowing to Kim Jong-un’s business enterprises, but then North Korea would become even more desperate in its pursuit of hard cash and might sell its nuclear technology. China could try to get someone to seize power from Kim Jong-un, but this could generate violent anti-Chinese sentiments in North Korea if it became known that China was behind such an attempt. Xi also needs support within his own party for his actions. The fates of Beijing and Pyongyang have been historically intertwined. North Korea helped Mao Zedong’s Red Army to win the Chinese Civil War of 1945–49. Mao gave the go-ahead for North Korea’s invasion of South Korea in June 1950, and when the United States came to Korea’s rescue and advanced as far as the Chinese border, Mao dispatched an army of “volunteers” who drove the Americans southwards and saved North Korea. Kim Il-sung established himself as the first “emperor” of North Korea’s Communist Kim dynasty. China and North Korea signed a friendship treaty in 1961, and when China and the Soviet Union fell out in the 1960s, Kim Il-sung succeeded in maintaining good relations with both Beijing and Moscow. This was not without problems. Kim Il-sung felt betrayed when Mao agreed to a visit from US president Richard Nixon in 1972. Three years later, in 1975, when Kim again asked Mao for the go-ahead to invade South Korea, Mao said no. The next betrayal came in 1992, after the breakup of the Soviet Union, when China recognized South Korea. At that point, Kim Il-sung had already decided to develop his own nuclear weapons. The International Atomic Energy Agency soon discovered that North Korea was producing plutonium. In 1994, this provoked an acute crisis between North Korea and the United States. President Bill Clinton gave serious consideration to a military strike, but instead an Agreed Framework was reached that resulted in North Korea’s nuclear programme being put on hold until 2002. In 2003, the year after president George W. Bush had declared North Korea to be a member, along with Iran and Iraq, of “the axis of evil”, North Korea withdrew from the Non-Proliferation Treaty and restarted its nuclear programme in full. This occurred under “Kim the Second” (Jong-il), who led North Korea from Kim Il Sung’s death in 1995 until his own death in 2011, when his youngest son, “Kim the Third” (Jong-un), took over. Under the leadership of Kim Jong-il, relations between China and North Korea were reasonably good, and China hosted the so-called six-party talks (between China, the United States, Japan, Russia, North Korea and South Korea) in the years 2003–9. Agreements were signed on two occasions with the intention of halting North Korea’s nuclear programme, but since 2009 no negotiations have taken place. Xi Jinping and Kim Jong-un have never met, and when Xi in 2015 hosted a grandiose programme of festivities to celebrate the 70th anniversary of China’s victory over Japanese militarism, the South Korean president Park Gyun-hye was among the most prominent guests, while Kim Jong-un stayed at home. Today China’s trade with North Korea is of little importance to China (but absolutely essential to North Korea), while South Korea is one of China’s most important trading partners. In recent years, China’s policy on North Korea has appeared unsuccessful, and several foreign policy experts in China have openly criticized their leaders for simultaneously making enemies of both North and South Korea. China participates in UN sanctions against North Korea and advocates a Korean peninsula free of nuclear weapons. This policy has succeeded, however, in encouraging Kim Jong-un to devote even more resources to developing nuclear weapons. In 2013 he had his powerful pro-China uncle, Jang Song-thaek, executed. In 2016 he conducted over 20 missile tests and two nuclear tests. And in 2017 he allowed the murder of his elder half-brother, Kim Jong-nam, at Kuala Lumpur’s international airport. Kim Jong-nam was travelling to Macao, where he lived under Chinese protection. North Korea may now be in the process of developing a hydrogen bomb. Kim Jong-un is also attempting to develop an intercontinental missile that could reach the United States. He has already built missiles that use solid rather than liquid fuel, meaning that they can be fired at short notice. This is not simply a setback for China’s policy on North Korea. It has also damaged China’s relationship with South Korea. South Korea’s recently deposed and imprisoned president Park Gyun-hye decided to deploy the American THAAD anti-ballistic missile system in South Korea. This has led to angry protests not only from Pyongyang but also from Beijing, which fears that the system could also be used against China. South Korea defied China’s protests, and China reacted by imposing sanctions on South Korean companies involved in the THAAD programme. The upshot was that China succeeded in worsening its relations with both Korean states simultaneously. Ironically enough, Trump may now be helping China to change its policy on Korea in a direction that is in China’s own interests. By cooperating with the United States in exerting pressure on North Korea to stop further missile and nuclear tests, China can reduce South Korea’s need for an anti-ballistic missile system at a time when South Korea is about to elect a new president (elections are being held on 9 May). One of the two frontrunners, Moon Jae-in, is a critic of the United States and opposes the deployment of THAAD. Instead he advocates improving South Korea’s relationships with both China and North Korea. Accordingly, by helping Trump, China can also help its own position. And if Trump then also forgets his own electoral promises to reduce imports of cheap Chinese industrial goods, this will be a double bonus for Xi.